S0704. BENNO RABINOF, w.Alfred Wallenstein & Robert Stanley Cond. 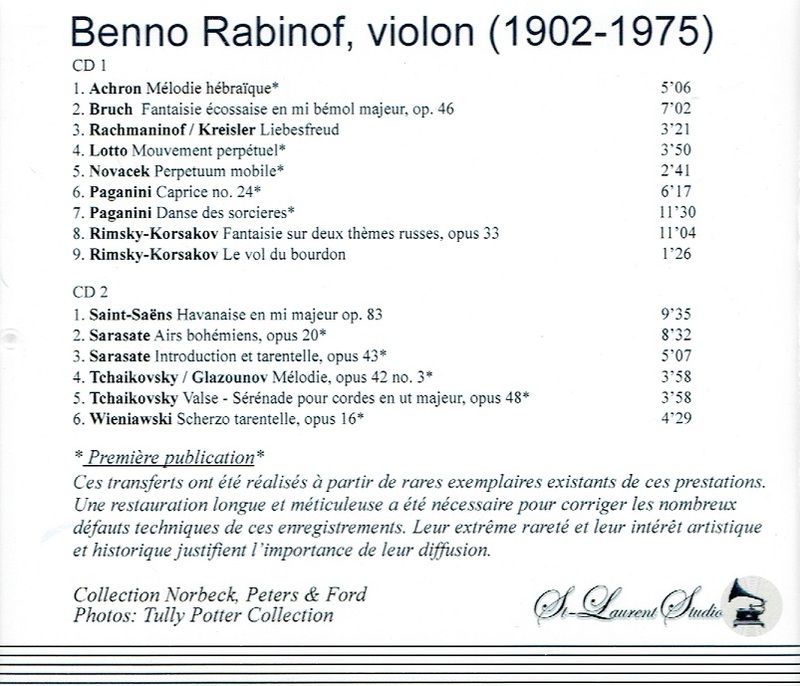 : Paganini, Lotto, Sarasate, Rimsky-Korsakov, Saint-Saï¿½ns, Wieniawski, Tschaikowsky, Rachmaninoff, Novï¿½cek, Achron & Bruch. (Canada) 2-Yves St Laurent YSL 78-411, Live Performances, 1943-44 [all from Rabinof's private acetates, not duplicated by the old out-of-print Pearl issue]. Transfers by Yves St Laurent. 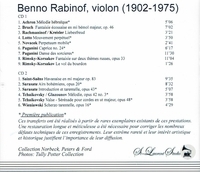 "In his playing, Benno Rabinof represented the continuation in America of Auerï¿½s most brilliant pupils from Russia, perhaps more so than any of the numerous other hopefuls who flocked to the Auer banner after his American arrival. Auer conducted the 19-year old Rabinof's 1927 Carnegie Hall debut in the Tschaikowsky and Elgar Concerti - like so many others in the Heifetz shadow, Rabinof was unable to generate a top-level career despite encouraging reviews. In the early 1940s he played a 28-week cycle of nationwide radio broadcasts [above] with Alfred Wallenstein conducting. 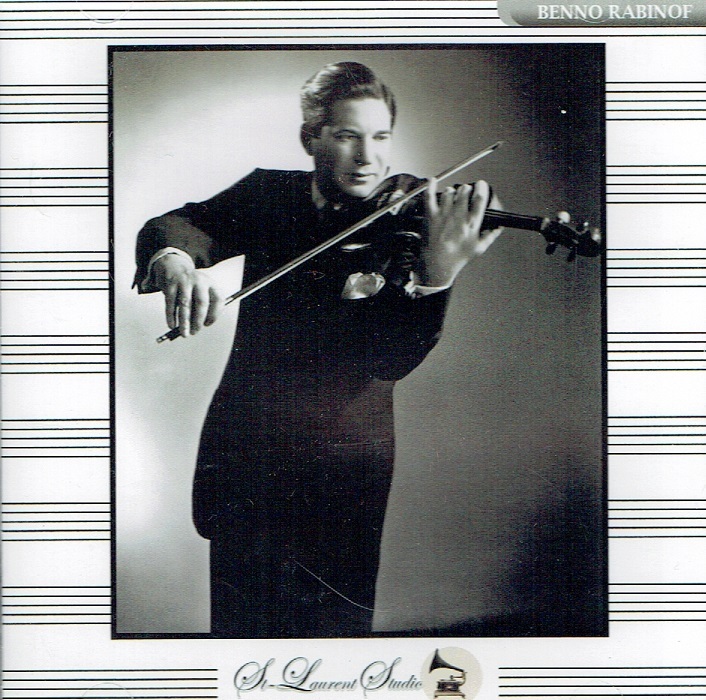 I recall being thoroughly impressed; he understood and employed the expressive devices in position changes of both Heifetz and Kreisler with good taste. Technically, he could handle any genre of music in the staple repertoire with ease. In the hierarchy of ear-titillating vioinists, Rabinof ranks among the elite. It was essentially instinctual, spontaneous, visceral playing." “Cellist and conductor Alfred Wallenstein was a prodigy on his instrument, and later became the principal cellist in two of America's finest orchestras. As a conductor, he made music over the radio on a regular basis, using that ‘podium of the air’ to perform neglected works and those written by contemporary composers. Soon after his birth, the family moved from Austria to Los Angeles. At age eight, Alfred was given a cello by his father and began lessons with the mother of composer Ferde Grofé. Following further studies with Julius Klengel, he made his début in Los Angeles and swiftly gained a reputation as a child prodigy. After touring the country through the Orpheum theatre network, he returned to California and, at the age of 17, was appointed to the San Francisco Symphony. Subsequently, he was engaged by the famous dancer Anna Pavlova to perform as solo cellist in a South and Central American tour.